Roberto Henríquez, Luisa María de Aquino, Fausto Fernández, Mioufen Celestín, Luis Felipe Aquino. Santo Domingo. – With a program including novel activities that will contribute to Dominican tourism and the development of the region’s traditional and emerging tourism markets, the 22nd annual Caribbean Tourism Bourse (BTC) is set from June 28 to 30 in the Hotel Dominican Fiesta Convention Center, an event which the Tourism Ministry sponsors since its inception. 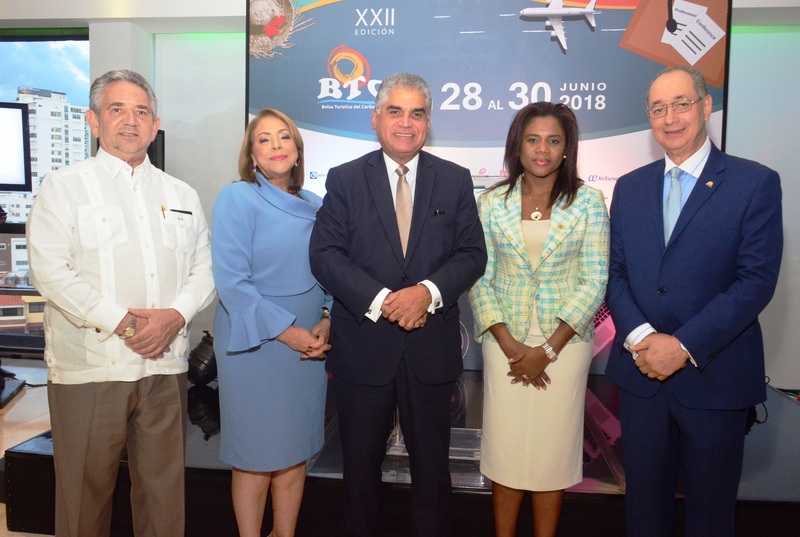 “I am very pleased to announce the 22nd edition of the BTC, whose purpose is to be a platform that contributes to the consolidation of national tourism, and promote non-conventional and emerging tourism destinations in Central and South America, in accordance with the principles of sustainability,” BTC president Luis Felipe Aquino told the press. “In this version of the BTC will participate more than 100 national and international exhibitors, including local and regional tour operators, and will place special emphasis on religious tourism, highlighting the symbols of religiosity of the peoples of the region that represent attractions of great interest to tourists,” Aquino said.